Annotated family tree of the Newnham and Atkinson families. Specimens collected by William Orde Newnham appear in several herbaria, most notably HLU and although he published little he is credited with some significant botanical discoveries and it is likely that some of his specimens, which may contain scant annotation, remain to be discovered in other collections. He was born in Farnham, Surrey, to the noted surgeon William Newnham and his wife Caroline Atkinson. His two younger brothers, Christopher Atkinson Newnham and Philip Hankinson Newnham, shared his interest in natural history with Christopher collecting plants and both Christopher and Philip also being lepidopterists. Their early interest in natural history appears to have been inherited from their mother's side of the family, with their grandfather Rev. Christopher Atkinson and an uncle, Rev. John Atkinson, havinging an interest in ornithology; the former also showing talent as an illustrator. Cousin Rev. John Christopher Atkinson was to become the noted "Canon Atkinson" of Danby, Yorkshire, a well-known and widely published antiquarian and naturalist. Another strong influence on William was Walter Waters Reeves, his father's assistant, and is thought that he accompanied him on local botanical expeditions. William was a student of St John's College, Cambridge, in the time of Henslow and it is here that he met, and became a friend of, Rev. 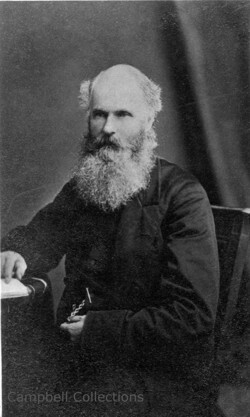 John William Colenso, a mathematician, amateur botanist, and later bishop of Natal. In 1855 he accompanied Colenso on a mission to Natal to act as the head of a grammar school for sons of the settlers of this new colony. Although personal tragedy forced a return to England in 1857, he went back to the colony six years later and remained there for almost twenty years. During his later years in Natal he founded the famous Hilton College and acted as its first headmaster. His final years were spent in England as incumbent of New Alresford and latterly Weston Patrick. Birth - Farnham William Orde Newnham, eldest son of surgeon William Newnham and his second wife Caroline née Atkinson, was baptised on April 27 at Farnham, Surrey. His date of birth is given by Venn, Cambridge Alumni. 1843 : Chesham The University of Hull herbarium HLU holds 35 plant specimens collected in 1834 by Newnham from the vicinity of Chesham, Bucks. There are a further 13 Chesham specimens from this year which seem likely to have been his, but they bear no collectors name. Mr. W. O. Newnham of St. John's College, Cambridge, has found this very rare plant in two ponds near Farnham, Surrey, on opposite sides of the town, namely Frencham Pond and Cuck Mills Pond: in both places it was accompanied by E. hexandra. It is a most interesting addition to the flora of the south of England, and the young naturalist by whom it has been discovered deserves great credit for accuracy of observation. The only recorded localities are in Anglesea and Ireland. - C.C.B. BOTANICAL SOCIETY - March 7 - E. Doubleday, Esq., V.P., in the chair. - W. O. Newnham, Esq. and T. W. Barlow, Esq. were elected Members. - Read - 'Notice of the Grasses found in the neighbourhood of Bristol,' by Mr. Thwaites. Arethusa newnhamiana A foram from the shell sand of Falmouth harbour was provisionally named after him by Robert L King, then of the Grammar School Truro. ... I have dedicated this pretty species to my friend W. O. Newnham, Esq., St. John's College, Cambridge. 1850 : M.A. William was awarded an M.A. degree by st John's College. The Ray Society Both William and his father are listed as subscribers to the Ray Society's publication The British species of Angiocarpous Lichens. Newnhamia - an Ostracod genus The genus Newnhamia was named by Rev. Robert L. King " ... after my old college friend the Rev. W. O. Newnham, in memory of many pleasant excursions in his compant in the neighbourhood of Cambridge and Farnham, in search of zoological and botanical wonders." MARRIAGES. NEWNHAM - WILSON. - January 2, at Capel, Surrey, by the Rev. R. G. Maul, assisted by the Rev. T. R. O'Flaharty, the Rev. William Orde Newnham, of Farnham, to Clara Campbell, daughter of the late Andrew Wilson, Esq., of Glasgow. Departure for Natal William and his new wife Clara were part of the party of missionaries who set out for Natal aboard the "Jane Morrice" with Bishop John William Colenso. Death of wife William's first wife Clara Campbell Newnham died in Natal shortly after giving birth to their daughter, also Clara Campbell. Return to England Hattersley, A. F. 1945. Hilton Portrait :South Africa Public School 1872-1945. Pietermaritzburg. "Unhappily, Newnham's wife died suddenly on 29 June 1857. The blow prostrated the young schoolmaster. Feeling that he could not continue to live in Natal, he handed over his pupils to James Green, colonial chaplain and dean of the unfinished cathedral of St. Peter, and returned to England, accepting an appointment as chaplain to St Mary's hospital, Paddington. Here he remained some six years, acquiring medical knowledge that was to be useful to him at Ladysmith and Hilton." MARRIAGES - NEWNHAM - DAY. - FITZGERALD - DAY. - On the 31st ult., at St. James's Paddington, by the Rev. R. G. Maul, assisted by the Rev. Cannon Boyd, the Rev. W. O. Newnham, to Fanny Charlotte, fourth daughter of Colonel Day, 99th Regiment; and at the same time and place, by the Rev. Canon Boyd, assisted by the Rev. R. G. Maul, Captain H. L. FizGerald, 13th Light Infantry, to Henrietta Emily, youngest daughter of Colonel Day, 99th Regiment. Return to Natal William and his new wife Fanny Charlotte Newnham sailed for Natal on the "Natal Star". Publication Remarks on some portions of Bp. Colenso's teaching, and its tendencies. P. Davis & sons, 24, Longmarket Street, Pietermaritzburg. Hilton College Hilton College, Natal, was founded in 1872 by William on land owned by Gould Arthur Lucas (1832 - 1914). He remained as headmaster until his return to England in 1877. Return to England Hattersley, A. F. 1945 ibid. "Newnham had now come to an end of his career as a schoolmaster [June 1877]. He sailed with his family for England at the end of the year, going first to Crawley in his old diocese of Winchester..."
ECCLESIASTICAL INTELLIGENCE, PREFERMENTS AND APPOINTMENTS. Rev. W. O. Newnham, curate of Crawley, near Winchester; Rector of St. John the Baptist, New Alresford, Patron, the Bishop of Winchester. ... Rev. W. O. Newnham, M.A., rector of New Alresford; rector of Weston Patrick, Hants. DEATHS. NEWNHAM - On the 5th inst., the Rev. William Ord [sic] Newnham, rector of Weston Patrick, Hampshire, aged sixty-eight.